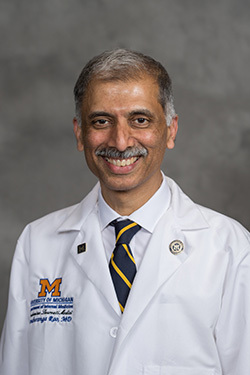 The Division of Nephrology at the University of Michigan is internationally recognized for the excellence of its clinical care and for its rich and diverse educational and research programs. The program is led by Panduranga Rao, MD, DNB, MS, who is the Program Director, along with Laura Mariani, MD, who serves as the Associate Program Director. An unusual balance and depth in both clinical and research training. Over forty-five dynamic faculty members whose expertise spans a wide range of clinical and research areas; many are national leaders in their fields and many have a demonstrated track record mentoring fellows. Two large hospitals (University and VA) that provide complementary and diverse patient populations. An outstanding renal transplantation program that transplants more than 200 new allografts per year. Large outpatient clinics in general nephrology and subspecialty clinics in transplantation nephrology, chronic hemodialysis, home hemodialysis, peritoneal dialysis, glomerular diseases, and nephrolithiasis. A dedicated Interventional Nephrology Unit and training in interventional nephrology, including procedures such as dialysis catheter placement, fistulogram, angioplasty, and renal biopsy. Opportunities for research training in fields including cell and molecular biology, biochemistry, immunology, clinical physiology, vascular biology, molecular genetics, developmental biology, biomedical engineering, clinical trials, epidemiology and outcomes research, health services research, and medical education. Superb physical facilities and intellectual environment across the Medical Center and the University.  The training program aims to take advantage of the exceptional clinical and scientific environment at the University of Michigan to train fellows to become both outstanding clinicians and future clinical or basic scientists in the area of nephrology. In general, five fellows are appointed to the program each year. The program especially seeks fellows with a long-term commitment to research and academic medicine. In addition, the program is committed to excellent training for those pursuing a career in clinical nephrology. For all fellows, the first year is largely clinical. For fellows intent on an academic career, two or three additional years are largely devoted to mentor-directed research in basic science, outcomes/epidemiology, or clinical research. Support during the second and third year may be provided by an NIH-training grant and for those who desire a career in clinical nephrology, the second year is largely clinical with rotations in hypertension, pediatric nephrology, outpatient dialysis, renal consultation, and interventional nephrology, as well as a number of elective rotations in related disciplines. A combined program in Pediatric Nephrology is available to properly qualified trainees. Finally, advanced training in transplant nephrology is available to those already board-eligible in nephrology and who are interested in a career in clinical or academic transplant nephrology. The Transplant Nephrology Fellowship Program is directed by Vahakn Shahinian, MD, MS.